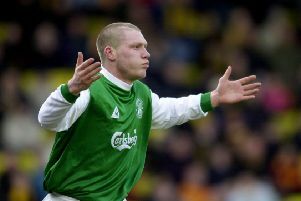 Hibs assistant boss Garry Parker believes this afternoon’s 1-0 victory at Hamilton is a massive weight off the club’s shoulders. Oli Shaw’s second-half strike at the Hope CBD Stadium was enough to give the Easter Road side their first victory in eight games and end a barren spell that had seen Neil Lennon’s men pick up just three points from a possible 21. In the 65th-minute substitute Daryl Horgan’s teasing cross from the left was expertly dispatched by Shaw from a couple of yards for the youngster’s second goal in three days. However, Parker, who has assumed media duties from Lennon recently, believes the victory over Martin Canning’s strugglers can restore some confidence to the dressing room. “There’s a big weight been lifted with that win so it’s a huge relief,” Parker said afterwards. “We did okay in the first half but when Emerson [Hyndman] came on he changed it for us. He’s a player who wants the ball and when he’s on it, it rubs off on everyone else. To have him back on the park made a big difference. Daryl Horgan’s contribution for the goal was excellent so the subs made a difference.